Savage Opress is a Star Wars: The Clone Wars minifigure released in June of 2011. The minifigure appears in one set: 7957 Sith Nightspeeder. The minifigure has a plain black leg piece, with a black torso piece that has yellow hands. Yellow printing is used on the torso piece to represent Opress' unclothed, tattooed body, with the tattoo pattern on both the front and the back of the piece. Some brown printing is also used on the front for detailing. A black body armour piece is worn over the torso, with grey printing for outlining and detailing, and silver is used for a belt buckle. The head piece is black, with yellow printing used for the tattoo pattern around the face. The eyes are white, with red and yellow irises and small black pupils. Brown printing is used for mouth and detailing, with some dark grey also present around the mouth area. 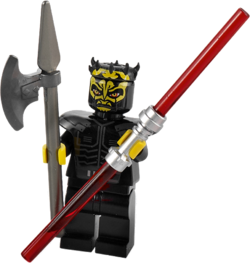 Savage Opress is one of two minifigures to have a Zabrak headpiece which goes on top of the head, the other being the latest variant of Darth Maul. The piece is designed to display the horns commonly found on Zabraks, Opress' piece being black with yellow printing that extends on the tattoo printing found on his face. Savage Opress comes with two weapons- a red double-bladed lightsaber with a silver hilt, and a metallic dark grey spear with an axe blade attached to it, representing the enchanted vibro-ax given to Opress by the Nightsisters. In LEGO Star Wars III: The Clone Wars, Savage Opress is a playable character in PC, console, and Nintendo 3DS versions, where for each version, his likeness is based on his physical minifigure. He is armed only with a double-bladed lightsaber, and has the ability to attack with this weapon, double-jump, and also use the Force to choke his enemies and interact with objects (including those that can only be influenced with the Dark Side of the Force). Additionally, he can cut through specified walls with his lightsaber, and jump up certain pairs of walls by burying his lightsaber in one wall and leaping to the next. In the Wii and Xbox 360 versions of the game, Opress is only able to be unlocked by using a code, MELL07, and is the only character that cannot be unlocked by any other means. In the Nintendo 3DS version, he can be purchased for twelve Play Coins after the completion all levels in Story Mode. Savage Opress was a Zabrak Nightbrother and for a short time, one of Darth Tyranus' Dark Acolytes. After several trials, Opress was selected by Asajj Ventress to aid her in assassinating her former Master. Savage was then altered by the Nightsisters which made him more powerful, enhanced both physically and in the Force. He was also placed under the Nightsister's control, so that they could order him without him questioning them. To ensure that he obeyed Ventress, she ordered him to kill his brother, Feral, which he did by strangulation. Opress was then given to Dooku by Mother Talzin, and Dooku took him as an Acolyte, training him in lightsaber combat and the ways of the Force. Opress carried out a number of missions for Dooku, amongst them single-handedly defeating a group of clone troopers with a Jedi Master and Apprentice. However, after his unsuccessful mission of capturing Toydarian King Katuunko alive, Ventress arrived when Tyranus was torturing his apprentice for his failure. The two originally attempted to take down Dooku together, but his building hatred broke his spell of allegiance to Ventress, and the fight became a three-way duel. However, Dooku and Ventress temporarily teamed up to take Opress down, forcing him to make plans to escape, which he was eventually successful in after fighting through droids and the recently arrived Jedi, Obi-Wan Kenobi and Anakin Skywalker. Opress returned to Mother Talzin, who informed her that he had another brother besides Feral, Darth Maul, and he departed alone on a quest to find him. Later, his quest led him to Lotho Minor, a junkyard planet. He finally found his brother, Darth Maul, in a cave. He was insane and frail. He brought Maul back to Dathomir and Mother Talzin. She brought him back to his sanity and gave him new strength. Later, Opress and Maul pillaged and murdered throughout the galaxy and began gathering the pirates who served Hondo Ohnaka . Once Obi-Wan Kenobi and Adi Gallia arrived, a brutal duel took place in which Opress lost his left arm to Kenobi and the brothers were left adrift in space when they escaped their exploding ship. They were found by Death Watch and given new cybernetics. After Vizsla's death, Sidious arrived and dueled Maul and Opress. However, Savage was ultimately killed when Sidious impaled him on his lightsabers. 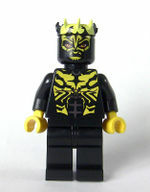 On LEGO.com, Savage's horns are black, but his horns are really yellow. This page was last edited on 14 May 2017, at 22:33.